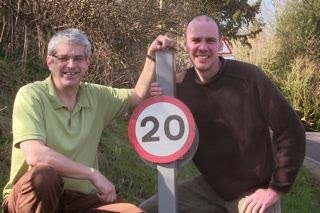 Ruscombe Green: 20mph - survey shows nearly 8 out of 10 want it! 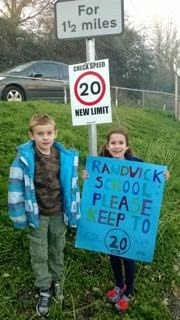 20mph - survey shows nearly 8 out of 10 want it! As many will know I have campaigned for years on the issue of slowing traffic. I am delighted that Jonathan Edmunds, the Green Party candidate for the ward (pictured left with me) is also passionate about this issue - indeed so are his children who have designed a poster (see below) to try and encourage cars to slow down. Anyway this week I have written to the County in support of their work to implement the 20 mph and consideration of further signage - a big problem has been many not seeing the signs or somehow thinking it is not a real 20mph zone! It is great to have heard many positive comments about the 20 mph while out canvassing - although there are clearly still concerns about some drivers. We do need to continue work to slow traffic - Jonathan is already looking at what can be done.